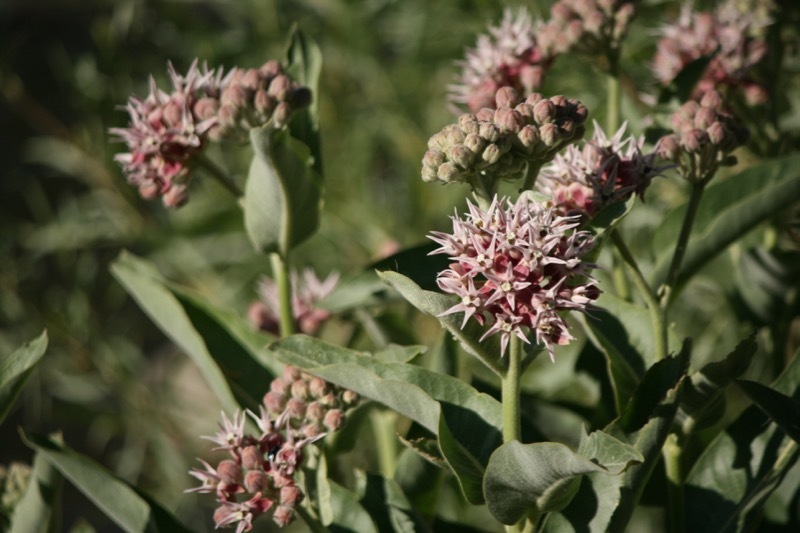 There are more than 100 species of milkweed in North America, but only two are common along the Truckee River: Showy milkweed (Asclepias speciosa) and Narrow-leaved milkweed (Asclepias fascicularis). If you take a close look at a milkweed, you’ll find that each plant is home to a community of insects. Some, like honeybees (Apis mellifera)) stop by for the nectar and the pollen. Others, like monarch caterpillars (Danaus plexippus) feed on the leaves and stems of the milkweed. Spiders and predatory insects might come to the milkweed to feed on other insects. (Click to enlarge) On left, Showy milkweed. On Right, Narrow-leaved milkweed. I went down to Mayberry Park earlier this week, and the Showy milkweed was almost finished blooming, but the Narrow-leaved milkweed was still going strong. Both of our local species can be identified by their star-shaped blossoms and the white milky sap that appears if you break a leaf. They are easy to tell apart: Showy milkweed have pink flowers and large, oval-shaped leaves; Narrow-leaf milkweed have lighter-colored flowers, and leaves that are….narrow. All were covered in an a great variety of insects. 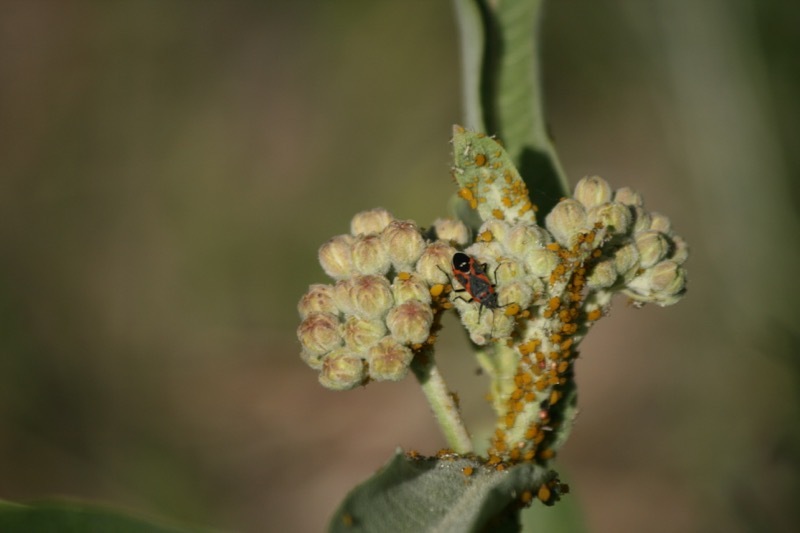 The Small Milkweed Bug (shown below in the company of aphids), has an oval-shaped body and back-markings that form a red “X”. 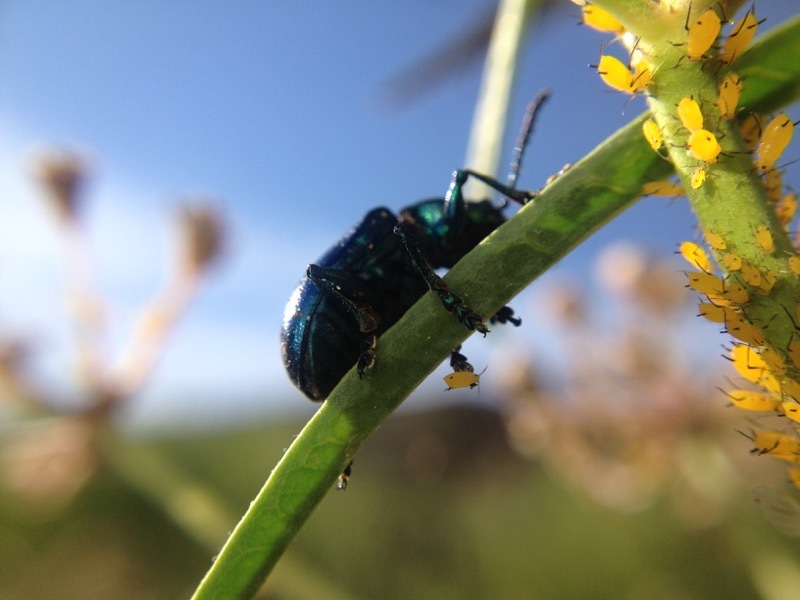 These bugs feed on milkweed seeds. When there are no milkweed seeds around, they also feed on monarch chrysalises, caterpillars, and each other. 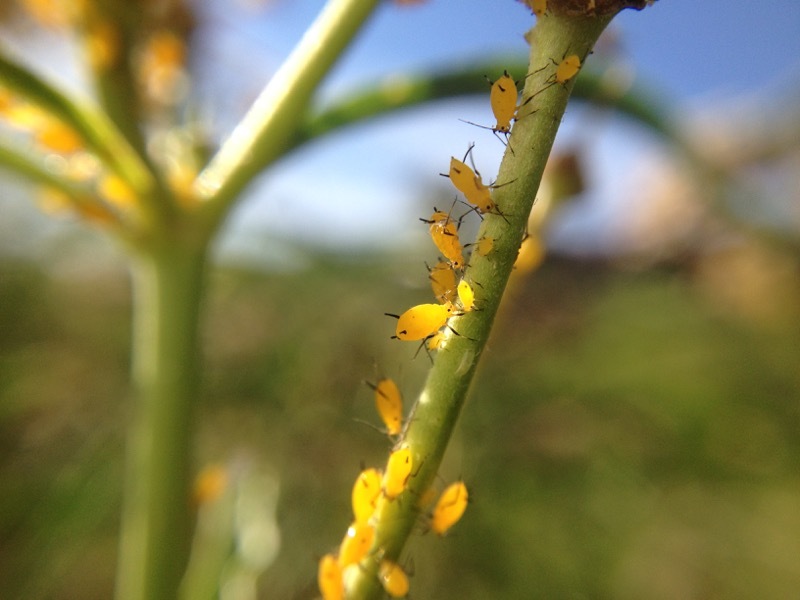 Oleander aphids are tiny insects with yellow bodies and black legs. They are a non-native species from the Mediterranean, and reproduce asexually; every Oleander aphid you see in the wild is a female. These are very common on milkweed, and generally found in large groups. 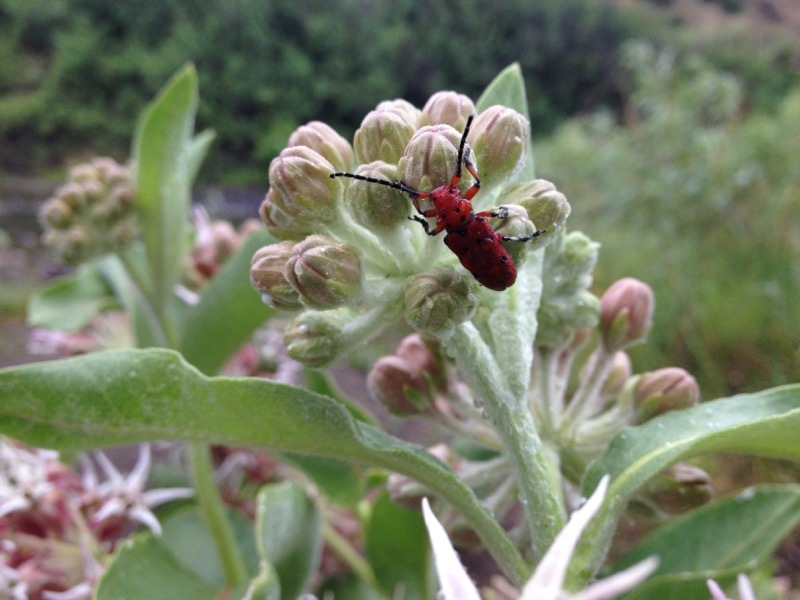 Red Milkweed Beetles have red bodies with black spots, and long black antennae. They incorporate toxins from milkweed into their bodies, making them bad-tasting to predators. 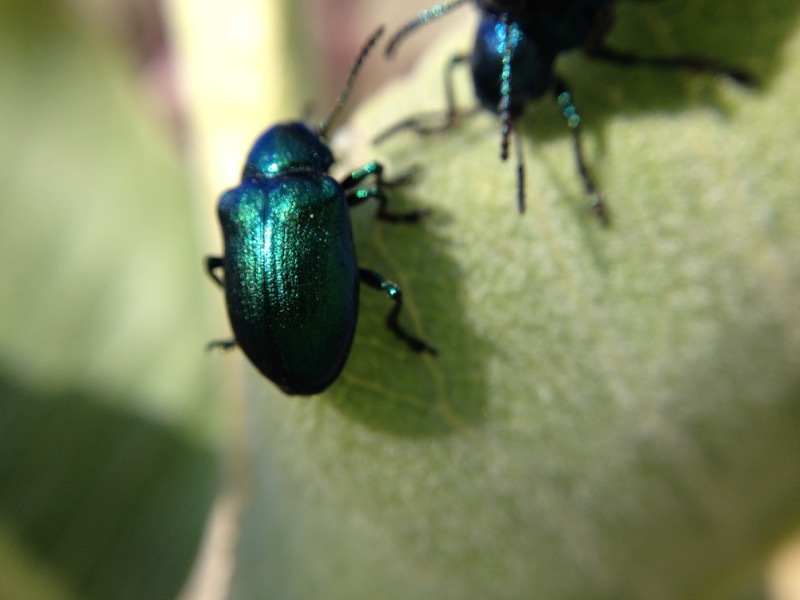 Blue Milkweed Beetles have green/blue iridescent bodies, and feed on the leaves of the milkweed plant. They are often seen in large numbers, and often are mating on the milkweed plant. 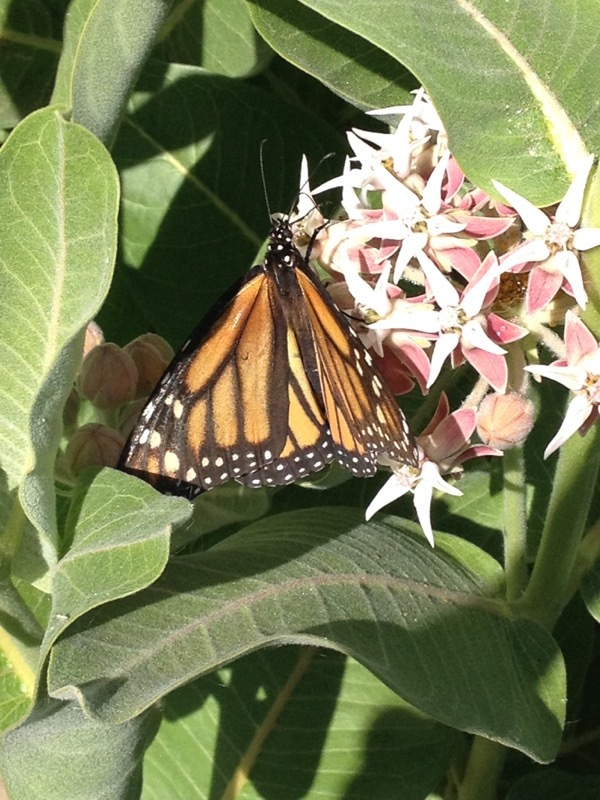 Monarch butterflies lay eggs on the leaves of the milkweed plant, and caterpillars feed exclusively on milkweed. Caterpillars are beautiful — striped black, white and yellow – and live on the milkweed plant for 14-18 days before forming a bright green chrysalis. Ten days later, an orange-and-black butterfly emerges. 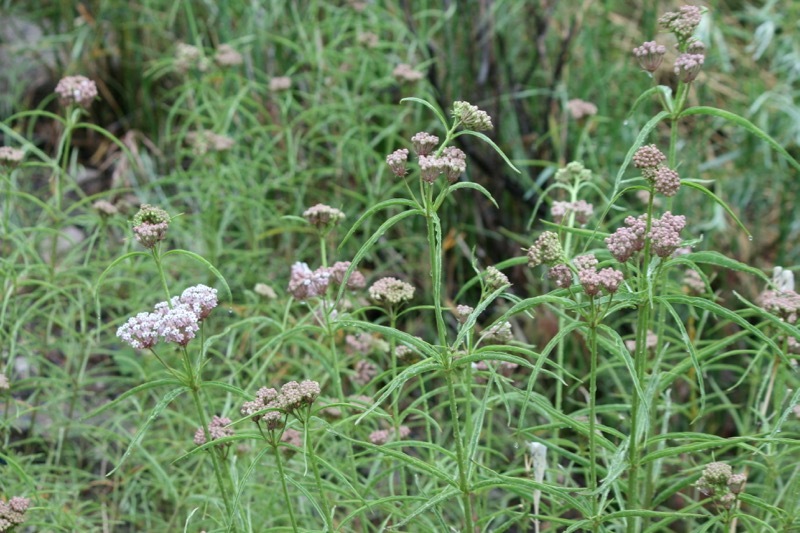 Along different parts of the river, milkweed plants can be at different stages, and the insects may be different as well. What do you see near you? Blue Milkweed Beetle and Oleander Aphids, Mayberry Park. June 30, 2015.